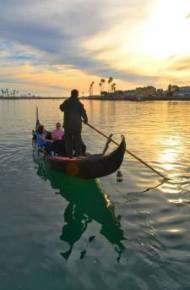 Founded in January 2014, Gondola Paradiso provides luxury Venetian-style cruises through the canals of the Channel Islands Harbor in Oxnard. Cruises leave from Seabridge Marina, located off South Victoria Avenue at the Channel Islands Harbor, 1301 S. Victoria Avenue, Oxnard. To book a cruise, call (805) 616-4475 and for more information visit www.gondolaparadiso.com.